Ottawa, ON, December 15, 2016 – According to statistics released today by The Canadian Real Estate Association (CREA), national home sales were down on a month-over-month basis in November 2016. National home sales fell 5.3% from October to November. Actual (not seasonally adjusted) activity remained 1.6% above levels in November 2015. The number of newly listed homes edged down 0.4% from October to November. The MLS® Home Price Index (HPI) in November was up 14.4% year-over-year (y-o-y). The national average sale price climbed 7.3% y-o-y in November. The number of homes trading hands via Canadian MLS® Systems declined 5.3 percent month-over-month in November 2016. This represents the largest monthly decline in activity since August 2012. As a result, the number of homes changing hands now stands at the lowest level since September 2015. Activity was down on a month-over-month basis in about two-thirds of all local markets, including Canada’s most active markets. 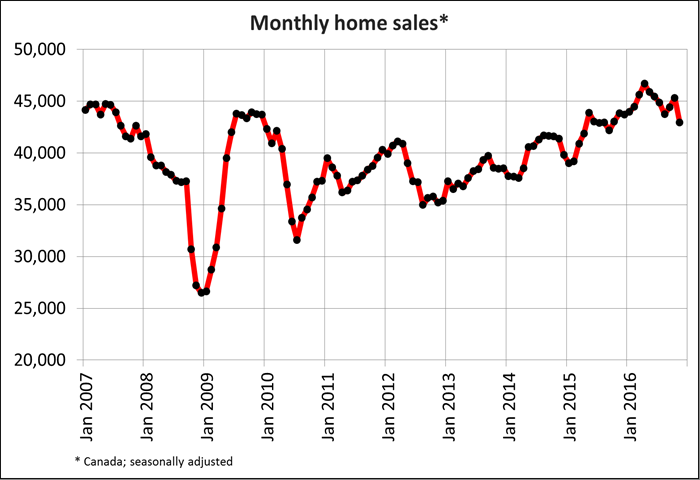 Actual (not seasonally adjusted) sales activity held 1.6 percent above where it stood in November 2015 – the smallest year-over-year increase since October 2015. Y-o-y activity gains in the Greater Toronto Area (GTA) and environs were offset by declines in B.C.’s Lower Mainland. The number of newly listed homes edged down 0.4 percent in November 2016 compared to October. New listings were up from the previous month in close to half of all local markets, led by the GTA but offset by declines in B.C.’s Lower Mainland. The national sales-to-new listings ratio declined to 59.8 percent in November compared to 62.9 percent in October. The ratio was above 60 percent in almost half of all local housing markets in November, the vast majority of which are located in British Columbia, in and around the Greater Toronto Area and across Southwestern Ontario. In Greater Vancouver, the ratio has moved out of sellers’ market territory and into the mid-50 percent range. There were 4.8 months of inventory on a national basis at the end of November 2016 – up from a six-year low of 4.5 months in October, and the highest level since March 2016. The tight balance between housing supply and demand in Ontario’s Greater Golden Horseshoe region is without precedent (including the GTA, Hamilton-Burlington, Oakville-Milton, Guelph, Kitchener-Waterloo, Cambridge, Brantford, the Niagara Region, Barrie and nearby cottage country). In November, the number of months of inventory ranged between one and two months in many of these housing markets, and stood below one month in the Durham Region, Orangeville, Oakville-Milton, Kitchener-Waterloo and Cambridge. 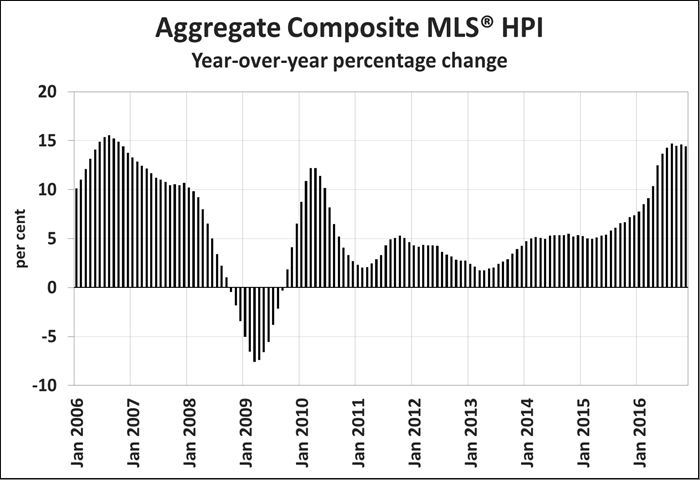 The Aggregate Composite MLS® HPI rose by 14.4% y-o-y in November 2016. This is down from 14.6% in October and reflects a slowdown in single family home price appreciation. Benchmark prices for two-storey single family homes and townhouse/row units posted the biggest y-o-y gains in November 2016 (16.3% and 16.0% respectively). Price increases were not far behind for one-storey single family homes (13.7%) and apartment units (11.5%). While home prices rose on a y-o-y basis in 9 of the 11 markets tracked by the MLS® HPI, gains continued to vary widely. The Fraser Valley (+29.7%) posted the largest y-o-y gain in November, while gains of around 20% were recorded in Greater Vancouver, Victoria and Greater Toronto (+20.5%, +20.6% & +20.3%, respectively). Vancouver Island also registered a double-digit increase in home prices (+16.8% y-o-y). By contrast, home prices were down 4% y-o-y in Calgary, and edged lower by 1.2 percent y-o-y in Saskatoon. As a result, home prices are off their 2015 peaks in these markets by 5.5% and 3.9% respectively. The actual (not seasonally adjusted) national average price for homes sold in November 2016 rose 7.3% y-o-y to $489,591. That said, Greater Vancouver’s share of national sales activity has diminished considerably of late, giving it less upward influence on the national average price. Even so, the average price is reduced by almost $130,000 to $361,260 if Greater Vancouver and Greater Toronto sales are excluded from calculations.